I can’t blame the local clergy in Bathurst Township, but I spent most of my childhood believing it was the church telling people it was wrong to eat ice cream before Easter. By the time I was in grade 7 or 8, at Glen Tay Public School, I figured out for myself that it was Mother’s choice to ban ice cream from our old chest freezer, during the 40 days of Lent. Lent began with Ash Wednesday each year, and was a time for moderation, reflection and spiritual discipline, in the weeks leading up to Easter. It doesn’t have anything to do with ice cream; at least not at anyone else’s house……….but it did at ours. 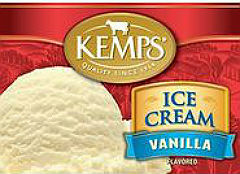 Mother loved ice cream; particularly vanilla ice cream. Although she was just an average-sized person, she had no trouble at all polishing off an entire gallon by herself, after the supper dishes were done. She’d grab a tablespoon, and the carton of vanilla, and head for the couch in the living room. When I think back now, it wasn’t even particularly good ice cream; at least not compared to what we can get today. She would buy the cheapest ice cream she could find, which was usually the ‘Top Value’ brand from the IGA store, on Wilson Street in Perth. Once she’d opened the carton and dug that tablespoon in, we all knew that the ice cream’s days were numbered. She wouldn’t always finish the whole thing at one sitting, but she’d have a good go at it for sure. Sometimes she’d complain later that evening that her stomach was troubling her, or that she had indigestion. She’d look over at Dad sitting contentedly in his lazy-boy chair, and ask him if she could have one of his Tums that he always carried in his pocket. She’d go on to say that she didn’t know why her stomach felt at bit ‘off’, despite the fact that the carton would be empty, and laying defeated in the garbage can, in the back porch. Dad was always too polite to say what was obvious to the rest of us. Mother often told us about growing up in the 1920s in Edmonton, and how each night her mother sent her to the corner store, to buy a vanilla ice cream cone. She carried it home gingerly, catching drips on her tongue, before handing the prize over to her mother. Maybe this is where her love of ice cream began, although that still does not explain how she managed to consume it in such huge quantities. So, as Lent rolled around each year, very early in the spring, Mother would announce that she would be giving up ice cream for the next 40 days. For the six weeks that followed, true to her word, there would be no cartons of ice cream in our shopping cart at the Perth IGA, no sign of the stuff in our old chest freezer. There were no cones consumed, nor ice cream sundaes, not one banana split, or even a vanilla shake; not a drop of the stuff in the house, for a month and a half. Looking back, I understand now that the absence of frozen dairy products in our house wasn’t a rule imposed by the clergy. It wasn’t religious doctrine from our Calvin Church in DeWitt’s Corners. No, it was nothing of the sort. It was Mother’s own choice, to give up her favourite food, for the forty days of Lent each year. It was her way of giving up something that she loved; her small sacrifice. It was her way of showing a little spiritual discipline, leading up to one of our most special holidays of the year. To me, it was one of the signs that spring was on its way, after the long, harsh, winter in Lanark County. Soon the snow would turn to rain, and wash away all of the signs of the dark, dreary, months behind us. The days would stretch out a bit longer, as the mercury rose a little higher in the old thermometer, outside our kitchen window. Soon Easter would be here, and we’d be dressed in our finest hats, and little white gloves, at Calvin Church, and yes, Mother would be eating her beloved ice cream once again. This entry was posted in Short Stories and tagged Arlene Stafford-Wilson, Edmonton, ice cream, lanark county ice cream, Lent, perth ice cream, spring. I can totally relate to your story of Lent and abstaining from our favourite treats. Hi Shirley – I still remember the little hats and white gloves that we all wore on Easter morning. Times have changed. I miss those days!